Introducing the Whispers Strokes Brush Marker caddy. 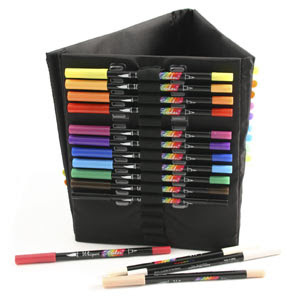 The set includes 36 dual end brush markers conveniently housed in a freestanding caddy. The caddy can also be folded flat for easy storage or crafters on the move. The high quality water based and acid free ink make Whispers Strokes ideal for all your card making and Scrapbooking projects. The fine end of the pen is ideal for hand journaling or doodling directly onto your scrapbook pages or use the brush nib to define the edges of patterned papers, smudging the ink a little with your fingers for a softer look. Use the pens simply for directly colouring in your stamped images or Outline stickers. By adding a little water to the ink you can easily create subtle water coloured effects using a paintbrush. The pens are also ideally suited to rubber stamping projects. Simply use the markers to colour directly onto the rubber stamp using one or more colours and press down onto your project to reveal a wonderful multicoloured stamped effect. For a more subtle and artistic finish, spray a little water onto the inked stamp before stamping to allow the colours to blend together a little more. With 36 beautiful colours to choose from the Whispers Strokes Brush marker caddy will add colour to your projects for years to come! It normally sells for £39.99 for 36 colours, mine has 54 pens.